Sometimes I think Simone Leigh and I always have been in conversation. Several years ago, I contacted her when I was a Contributing Editor for Collaboration and its (Dis)contents, a book about artist collaborations published by The Courtauld Institute of Art. I decided to interview Leigh and Liz Magic Laser about their 2011 film Breakdown. Because the discussion had been so fluid and we wanted to continue roaming over ideas so key to our lives and to our parallel practices, Leigh then asked me to interview her for the Herb Alpert Award for Visual Art. It was 2016 and Leigh had had a stunning year. She received the Herb Alpert directly on the heels of the prestigious John Simon Guggenheim Fellowship. She could have asked anyone to interview her, but she contacted me. Leigh and I share so much, a strong Jamaican heritage, a love of Maine, a deep knowledge of Zora Neale Hurston and yet Years of Seeing Red will be our first one-on-one talk. Early last year, I curated the critically acclaimed exhibition Vanishing Points exploring the visibility and invisibility of identity in our proto-digital and digital ages. Included was a wall-size artist manifesto by Black Women Artists for Black Lives Matter, a collective founded by Leigh. A panel discussion with a few members of the group highlighted not only Leigh’s founding role, but also how she has acted as a mentor for now hundreds of black women artists. This discussion will focus on Leigh’s practice, on her formal and material interrogations as well as the pivotal role of black women in the face of much needed social justice. –Andrianna Campbell on her working relationship with artist Simone Leigh. For this program, organized in collaboration with Denniston Hill, Campbell and Leigh will speak in-depth about Leigh’s artistic practice. This event is free and open to the public, though seating is limited. To attend, please RSVP to rsvp@curatorsintl.org with SIMONE in the subject line. Simon Leigh’s practice incorporates sculpture, video, and installation, all informed by her ongoing exploration of black female subjectivity and ethnography. Her objects often employ materials and forms traditionally associated with African art; her performance-influenced installations create spaces where historical precedent and self-determination comingle. Through her investigations of visual overlaps between cultures, time periods, and geographies, she confronts and examines ideas of the female body, race, beauty, and community. Leigh is a recipient of the Joyce Alexander Wein Artist Prize (2017), John Simon Guggenheim Fellowship (2016), Anonymous Was a Woman Award (2016), Herb Alpert Award for Visual Art (2016), and A Blade of Grass Fellowship for Socially Engaged Art (2016). She has also been the recipient of the Louis Comfort Tiffany Foundation Biennial Award (2013), Creative Capital Grant (2012), LMCC Michael Richards Award (2012), and Joan Mitchell Foundation Grant for Sculpture (2011). Recent projects and exhibitions include Trigger: Gender as a Tool and as a Weapon (2017) at the New Museum of Contemporary Art, New York; Psychic Friends Network (2016) at Tate Exchange, Tate Modern, London; The Waiting Room (2016) at the New Museum of Contemporary Art, New York; The Free People’s Medical Clinic (2014) a project commissioned by Creative Time; inHarlem, a public installation presented by The Studio Museum in Harlem at Marcus Garvey Park, New York; and a solo exhibition at the Hammer Museum, Los Angeles. This program is part of a collaboration between ICI and Denniston Hill‘s Artist Residency program. Andrianna Campbell was in residence in 2017 at Denniston Hill, located in the southern Catskills. Andrianna Campbell, a Denniston Hill alumna, is a doctoral candidate in the Department of Art History at the CUNY Graduate Center, where she specializes in art of the modern and contemporary period. Her doctoral research focuses on Norman Lewis and Abstract Expressionism. Alongside her scholarly research, she is the author of essays and reviews on contemporary art for Artforum, Art in America, Frieze and Mousse. In 2016, Campbell was a co-editor of Shift: A Graduate Journal of Visual and Material Culture and a special edition of the International Review of African American Art dedicated to Norman Lewis. Campbell is a founding co-editor of the peer-reviewed journal apricota. She has taught at Parsons, the New School for Design and Yale University. She is the recipient of numerous fellowships and awards including the Dean K. Harrison Fellowship, the Preservation of American Modernists Award, the Library Fellowship from the American Philosophical Society, the Andrew W. Mellon Fellowship at the Dia Art Foundation, the Dissertation Writing Fellowship at the New York Public Library, the CASVA Twelve-Month Chester Dale Fellowship from the National Gallery of Art for 2016-2017 and is a Robert Rauschenberg Foundation Resident for 2018. 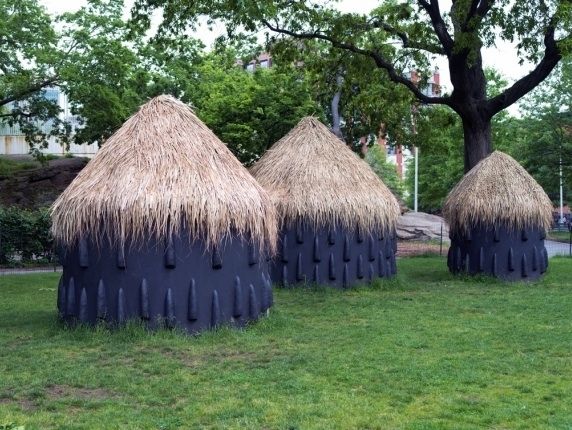 Image: Simone Leigh, A particularly elaborate imba yokubikira, or kitchen house, stands locked up while its owners live in diaspora (installation view), 2016. Presented by The Studio Museum of Harlem in Marcus Garvey Park, New York, NY, August 25, 2016–July 25, 2017. © Simone Leigh; Courtesy of the artist and Luhring Augustine, New York.